I never had the pleasure of meeting Monte Ghertler, though he lived but a few blocks from me, in the St. George Tower. I have known his daughter, Louise Crawford, for just over a year and a half. Along with producing Only The Blog Knows Brooklyn and being The Brooklyn Paper's "Smartmom", Louise conceived and organized the Brooklyn Blogfest. As I've noted before, she has been generous with help and encouragement to me and to this blog. My heartfelt condolences to Louise, her mother, her husband and children, her sister, Caroline, whom I met in the Clark Street subway elevator when I mistook her for Louise, and all others who knew and loved Monte. Having read Louise's sweet farewell, I only wish I could have known him. On the trail of the Continental Army, cont'd. In a previous post, I described a tour, guided by Brenda Becker, in which we viewed sites in Prospect Park, Brooklyn, at which the first events of the Battle of Brooklyn (also called the Battle of Long Island) unfolded. The initial skirmishes took place on the hilly terrain where the park is now located, and where British troops, under General William Howe, advancing northward from their landing at Gravesend Bay first encountered elements of the Continental Army, under the command of George Washington, which had been deployed on Long Island to protect New York City from an attack from the east. The battle, as it developed, was a series of holding actions by American units that allowed the majority of Continental troops to escape to the westward. The fiercest of these actions took place in and around the Old Stone House, where a Maryland unit suffered 256 lost covering the retreat. The Continental Army, having largely escaped Howe's initial thrust, encamped at Brooklyn Heights. Indeed, the building in which I now sit writing this probably occupies ground on which troops endured a soaking rain. The bad weather was actually a break for the Americans, as it forced Howe to halt his advance and gave Washington and his subordinate commanders time to plan a retreat. The American position on the Heights was untenable, as Howe's troops surrounded them on the land side to the east, and on the other side was the East River, where a shift in wind direction--which so far had favored the Americans--would allow the British Fleet, under the command of Howe's brother, Richard, to attack them and prevent any further escape to the west. 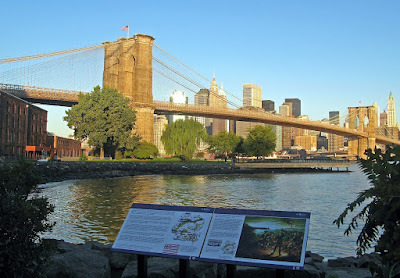 The historical marker in the foreground of the photo above notes that the area in front of it, now a small cove off the East River in the area between the Brooklyn (seen in the photo) and Manhattan bridges now called "DUMBO", but probably a very different looking place in 1776, before extensive shoreline filling was done, is roughly the site from which Washington's Army made its escape from Long Island. This was done under cover of night, and later morning fog which also was a blessing for the Americans. The crossing was made in boats crewed by seamen from Marblehead, Massachusetts, under the command of Colonel John Glover. Once the wind shifted and allowed the British fleet to sail into New York Harbor, the Continental Army was unable to defend New York City, and retreated first to upper Manhattan, then to Westchester County, fighting delaying actions in both places. They then crossed the Hudson and retreated through New Jersey to eastern Pennsylvania, where they endured their winter encampment at Valley Forge. The same Marblehead boatmen who facilitated the escape from Long Island would, a few months later, be involved in Washington's crossing of the Delaware, leading to his victories at Trenton and Princeton. Are the Rays the Mets of '08? It's beginning to look that way. At least it's the Red Sox, not the Yanks, who are likely to benefit from this collapse. Of course, it's still possible that the Mets could be the Mets of '08. College football weekly: Bulls behave normally while Gators don't; Pirates pillage and burn. Predictably, my South Florida Bulls came off an easy opener romp over Tennessee-Martin by falling flat in the second half of their joust with the Central Florida Knights, the closest thing these schools have to an Ur-rivalry, and just escaping with a win in OT. Next week they play Kansas. My gut says they get upset, but my head says they'll wait until mid-season to get knocked off by some mediocre Big East team. Unpredictably, the Florida Gators did not go flat after their opener rout of Hawaii, and swamped the Miami Hurricanes, a team that's had their number for years, 26-3. They get a week's rest before facing Tennessee. The East Carolina Pirates look to maybe be this year's Boise State, after edging Virginia Tech in their opener and crushing eighth ranked West Virginia 24-3 yesterday. Things might stay interesting, in a good way, for a while. Update: In mentioning the upcoming USF/Kansas game, I wrote that Kansas winning would be an upset. However, a glance at the AP rankings in this morning's New York Times shows the New! Improved! Jayhawks ranked thirteenth, while the Bulls have dropped from seventeenth to nineteenth because of their inexcusable failure to run up the score on Central Florida. So, it's an upset that I'm hoping for, but my hopes aren't too high.